There are two groups who are absolutely going to love The Avengers. Second are those who live to see massive destructive and CGI special effects in their movie blockbusters, and pay no attention to trivia like character or plot. This movie has robot suits, monsters, creatures from another dimension, Norse gods, and much fighting and crashing and exploding. What’s not to like? 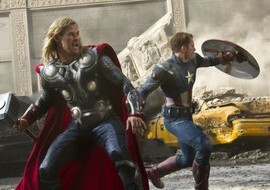 For the rest of us, though, The Avengers is an entertaining enough ride that lacks any real narrative weight. It’s Transformers with better – much better – dialogue. Credit for that goes to writer-director Joss Whedon who has to be wondering if it’s worth the effort. Cabin in the Woods, which he co-wrote, sat on the shelf for a couple of years before finally being released, and will make only a fraction of what The Avengers will do at the box office. Yet Cabin is a much better film. Whedon seems to have taken his cue from the Star Trek reboot. If the audience is coming for the heroes, who cares about the villain or the plot? The villain is Loki (Tom Hiddleston) who is here, apparently, because he was the original villain the Avengers faced in the comics. His motives are muddled and, in the end, we really don’t care. He’s closer to the Romulan Nero in Star Trek than to the gold standard of big screen comic villains, the Joker (whether played by Jack Nicholson or the late Heath Ledger). He snarls and he sneers and if he had a moustache he would undoubtedly twirl it, but he can’t hold our attention. "Transformers with better – much better – dialogue . . ."
Whedon focuses on the heroes and gives us some funny moments between Tony Stark/Iron Man (Robert Downey, Jr.) and Bruce Banner/the Hulk (Mark Ruffalo replacing Edward Norton who replaced Eric Bana). There’s a good throwaway bit early on with Black Widow (Scarlett Johansson) as well as an amusing confrontation between the Hulk and Loki. Yet Thor (Chris Hemsworth) and Captain America (Chris Evans) are as bland as ever, although Whedon gets a laugh or two out of the 1940’s Captain’s disconnect from 2012. There are few moments that are more than a snappy line or an amusement park thrill. One is the death of a character – not to be spoiled here – that manages to be both witty and poignant, a Whedon specialty. Another is Loki forcing a crowd to kneel before him in Berlin and one elderly man refusing to do so. The implication is that he is a Holocaust survivor, but there’s no follow through. So if you love CGI effects or are so immersed in the Marvel universe that you’re wondering when Spider-man and Wolverine will be joining the Avengers, you’ll have a great time. And when you stay through the closing credits for BOTH extra scenes, you’ll be able to explain who that guy is who grins at the audience and who means nothing to us non-Marvelites. On the other hand, if the first Iron Man was the only one in this series you thought worth seeing, one viewing of The Avengers should be plenty.